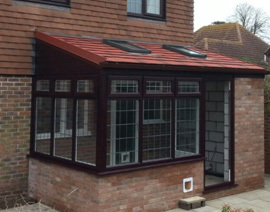 Why not make your conservatory into a year-round usable room with a Guardian warm roof? 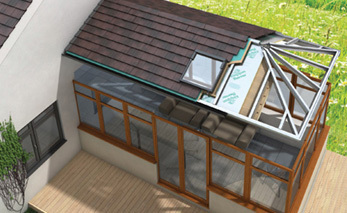 As certified installers of Guardian Warm Roofs, the Falcon Windows team have notched up extensive local experience installing Guardian warm roof systems over recent years and can quickly assess whether the warm roof system is appropriate for your current conservatory. Falcon Windows moved the patio doors to the end of Mr Belli's large conservatory, rebuilding the brick base-work and adding windows to make it feel more like a room. Then came the real 'piece de resistance' - "Falcon added a solid Guardian roof, so the conservatory's now a year-round dining room ... I'm very happy... great value for money..."
The innovative technology allows lightweight, highly insulated, solid roofs to be retro-fitted to most existing conservatories or included within new-build conservatories, making extreme temperature differences in conservatories a thing of the past. As planning permission or building regulations do not tend to be required for the installation of conservatories in most instances, a conservatory with a Guardian warm roof can be a highly cost-effective way to enjoy the space benefits of an extension all year round. The Falcon Guardian Warm Roof is a highly insulated, superior lightweight aluminium frame and high-tech Guardian 'slate or Guardian Metrotile system, designed to replace your existing glass or polycarbonate conservatory roof. 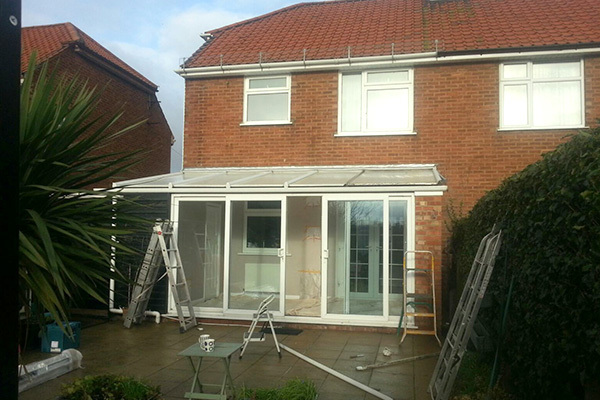 It can transform your conservatory into a beautiful, year-round garden room in just days. 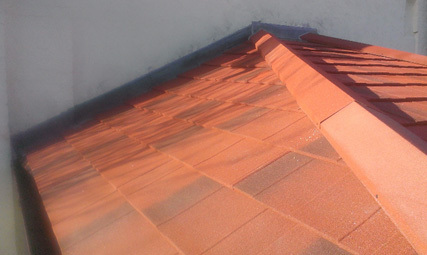 Quality engineered, fully ventilated,tested and approved to all thermal and structural standards, the Guardain warm roof looks like a slate or tiled roof and can also accommodate roof-lights or roof windows if required. The superior lightweight aluminum frame also avoids the shrinkage issues usually experienced with timber. Frames are manufactured pre-assembled and available as off-the-peg and bespoke solutions. Falcon Guardian Warm Roof 'slate' or 'tiling' systems are both long-lasting and recyclable. They are high-tech, extremely durable, both impact and heat resistant and offer the highest level of UV protection, controlling the interior temperature of your conservatory. Thanks to their high level of insulation, the Guardian warm roof helps cut noise pollution and delivers great energy efficiency too. 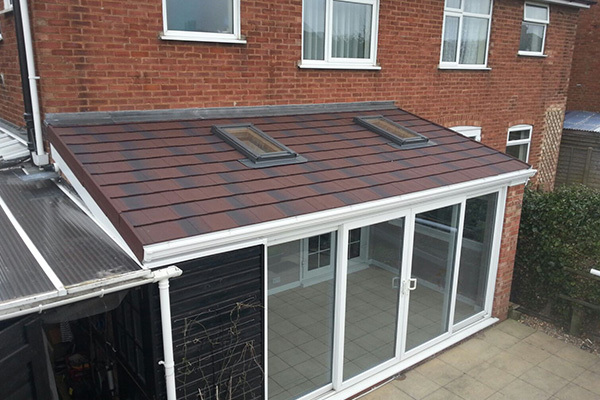 Interested in a Guardian warm roof for your conservatory? What does a Guardian Warm Roof conservatory look like? 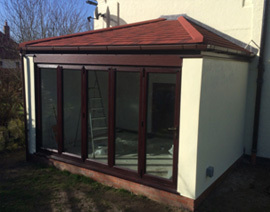 The Guardian warm roof frame will follow the design of the existing glazed walls of your conservatory, so whether you have a lean-to, multi-panelled Victorian-style or wide gable-end structure, the aluminum frame of the warm roof will be created especially to match your requirements. If you are installing your conservatory from scratch, you may consider a wide range of design options such as an orangery-style structure with brick-pillars which can look both contemporary and traditional with a 'solid' warm roof in place. The Guardian Warm Roof offers the choice of 'slate' or 'tiling' systems in a wide range of colours, to blend with your property and its surroundings. This is a lightweight, natural slate alternative made of resin-bonded, crushed limestone. Tested to high UV exposure, it has superior life expectancy with no risk of cracking and breaking and has virtually no fade - so your Guardian warm roof conservatory will stay looking good for many years to come. Guardian slate is available in 5 natural colours: black, terracotta, grey, brown and mulberry. This is lightweight, high grade steel with an Aluzinc coating and has a special hidden fix feature which leaves no nails exposed to corrosion. The Metrotile is available in 5 colour options: Black, Burnt Umber, Charcoal, Moss Green and Antique Red. How are Guardian Warm Roofs constructed? From the removal of the entire existing roof, the structural preparation for the hi-tech aluminum frame, to the addition of exterior grade plyboard, the breathable membrane and innovative slate or tiling system and inclusion of 3 layers (125mm total) of high performance insulation - this is how your new living space can be created in just a few days. Watch the transformation for yourself on the videos / animation below. Why choose a Guardian warm roof from Falcon Windows? There's even more to it than simply winning more space in your home - space that's easy and cost-effective to keep at just the right temperature for you and the family to enjoy it. When it comes to looks, installation, practicality and a straight-forward installation process, nothing quite compares to a Guardian warm roof from Falcon Windows Ipswich. The innovative system has been purposely engineered for the replacement of existing conservatory roofs or as an alternative to a glass or polycarbonate roofing structures. 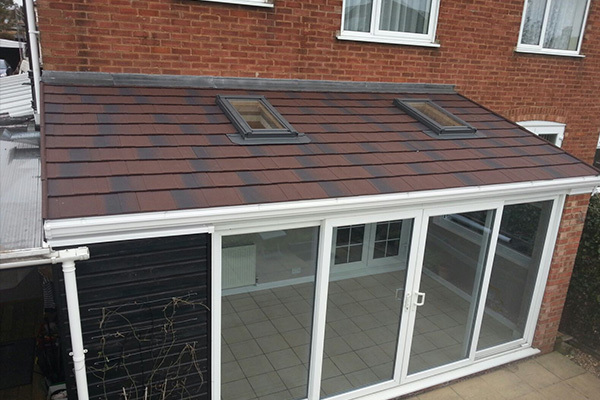 In fact, although there are many other roofing systems on the market in Ipswich and Suffolk, Guardian warm roofs are fast becoming the alternative roofing system of choice and premium conservatory roof for both tradesmen and home-owners alike. Whether you're looking to replace an existing roof or installing one on a new build extension project, the insulated conservatory roofing solution from Falcon Windows Ipswich is truly first in its class, manufactured from patented, pioneering profiles and tested to the highest UK standards. Falcon Windows Ipswich are a designated Guardian roof specialist in Suffolk. Our insulated conservatory roof installers are all fully trained by experienced Team Guardian members and carry the official 'Team Guardian' identification to verify their status. Complying with Team Guardian membership rules, we also provide guarantees and insurance backed warranties. You'll find also Falcon Windows listed as official installers on the Guardian Warm Roof website. Interested in how Guardian Warm Roof from Falcon Windows could transform your home?